*Note: If you would prefer that we include a sponge head of a particular size or color, just tell us in the "Comments" section when you order. "Note: Customers who really wish a 14" handle in their bag can order the above "Bag and Accessories Only", plus a 10" Two-Part Handle, and a 4" extender. A longer bag is going to be introduced soon, that will fit more handle lengths, as well as the new Fixed-Head Sponge with handle. Those new sponges do not fit in the present bag. 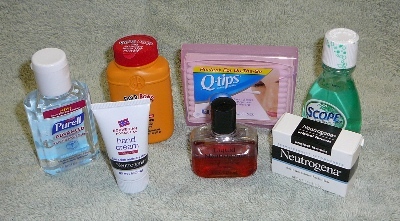 Photo suggests the kinds of things that some customers might consider buying at pharmacies to carry in their Travel Kit. (Not all items shown would fit at the same time.) Note that they are not included in the kit when we ship it to you, and we are not specifically recommending any brand or item shown in the photo.